Bang, bang — I love you. 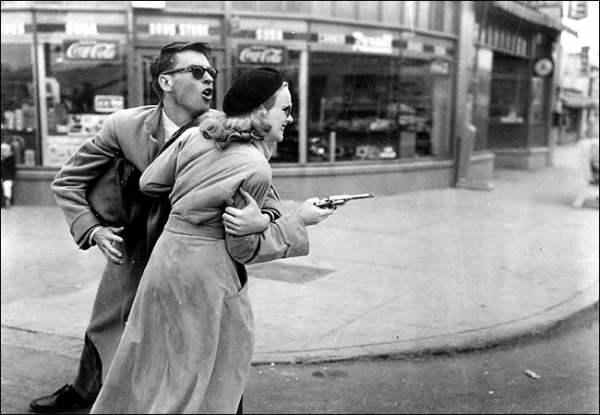 Gun Crazy (1950) depicts a kind of noirish Bonnie and Clyde story. For me, the heart of this feature is the relationship between Bart Tare and Annie Laurie Starr – here’s a peek inside the connection between this dysfunctional duo. It was love – or something – at first sight. 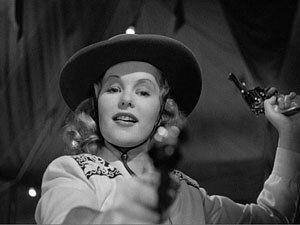 Gun Crazy’s sharpshooter Annie Laurie Starr (Peggy Cummins) makes her entrance on a carnival sideshow stage with guns blazing. Seated in the audience, with his two best pals, is Bart Tare (John Dall), newly returned from a stint in the army. As Bart watches, he literally leans forward in his seat, his face plastered with an ear-to-ear grin and his eyes wide and shining. And Laurie? Among the tent full of thrill-seekers, she zeroes in on Bart, points her gun straight at him – and fires. If that ain’t love, I don’t know what is. Does that burger look delish, or am I just hungry? Despite the instantaneous, irrefutable attraction between Bart and Laurie, and notwithstanding that they, according to Bart himself, went together like “guns and ammunition,” theirs was not exactly a match made in heaven. Oh, they had a wonderful time in the beginning – we see them taking a stroll hand in hand, picking out wedding rings, sitting blissfully by a waterfall, dancing at a swanky nightclub, living it up in Vegas. But the good times don’t last. Before long they’re hocking their rings at a pawn shop and turning down onions on a couple of (really tasty looking!) burgers at a roadside dive because they can’t afford the extra nickel. And it’s about this time that we learn that all is not sweetness and light with these two. Because, as it turns out, aside from their mutual affinity for firearms, Bart and Laurie couldn’t be more different. Let’s take a closer look. Money doesn’t seem to mean a whole lot to Bart. As they leave the carnival after being fired, Laurie half-jokes that Bart should have waited until payday to shoot at Packy. And Bart blithely responds, “I’ve got money. We’ll get along all right.” I don’t know where he got his money from – aside from his short stint at the carnival – or how much he has saved, but it couldn’t be too much. Still, he doesn’t seem concerned. It simply doesn’t matter. As Bart prepares to leave, Laurie tells him to kiss her goodbye – because she won’t be there when he gets back. She reclines on the bed, parts her lips seductively, lowers her lids . . . and the next thing we know, Bart has his gun pointed at some hapless clerk at the Traveler’s Aid. If you’ve never seen this film, or you’ve got a hankering to give it a much-deserved re-watch, you’ll soon get your chance – it’s airing on Turner Classic Movies on March 23rd. Make an appointment to spend 86 minutes in the company of these gun-crazy kids, Bart Tare and Annie Laurie Starr. You know why, don’t you? You only owe it to yourself. This is a revised version of a post that appeared on the 1001 Movies I (Apparently) Must See Before I Die website, for the Seven Shadows blog event in May 2012. ~ by shadowsandsatin on March 23, 2013. Thanks for the post. I’ve never seen this movie. I’m looking forward to watching it tonight. I envy you seeing it for the first time — I’d love to know what you think of it! It’s one of my favorites — I can never see it too many times. Great post on one of my favorite movies! Thanks so much, Diandra! It’s one of my favorites, too — the more I see it, the more I love it. A great review of a terrific movie! 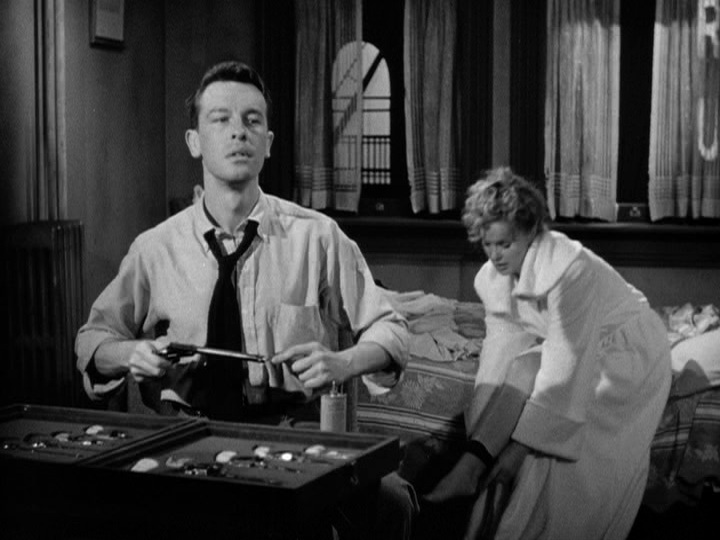 I’m a big John Dall fan and he is sooo good here. It’s too bad this film isn’t more well-known, and that’s why I’m happy to see your review. Thank you so much, RA — it was fun to write, too. Plus, it gave me an excuse to watch the movie for the zillionth time! Great stuff! Watched this “with you” and the gang at TCMparty last night. Hadn’t seen it in eons and was surprised to see how many scenes remind me of other films. But most of all I was impressed by how good Peggy Cummins is in it. I tweeted she is a (sort of) better version of Veronica Lake to me. (Not a Lake fan although I continue to try). Thanks, Aurora — I love watching my old favorites with the TCM Party gang! And I really like Peggy Cummins in this — she is one of my favorite femmes. She totally rocked this role. BTW, have you seen Veronica Lake in The Glass Key or The Blue Dahlia? I’ll let you know when I see that. I saw The Blue Dahlia eons ago so must revisit that one soon as well. Karen and company, when I read a book or watch a movie about lovers on the lam and the like, I usually playfully dub them “those crazy kids,” but in GUN CRAZY, they really ARE crazy kids! OK, to be fair, John Dall’s Bart is pretty much a fool for love who also happens to have excellent aim and gives love a shot (sorry, couldn’t resist!). I’d first seen John Dall in SPARTACUS and in Alfred Hitchcock’s ROPE, but I’, I was wowed by the chemistry between Dall and the dynamic Peggy Cummins, and the cinematography was top-notch! Hooray for TCM for bringing GUN CRAZY for The Essentials, and BRAVA to you for your superb post!